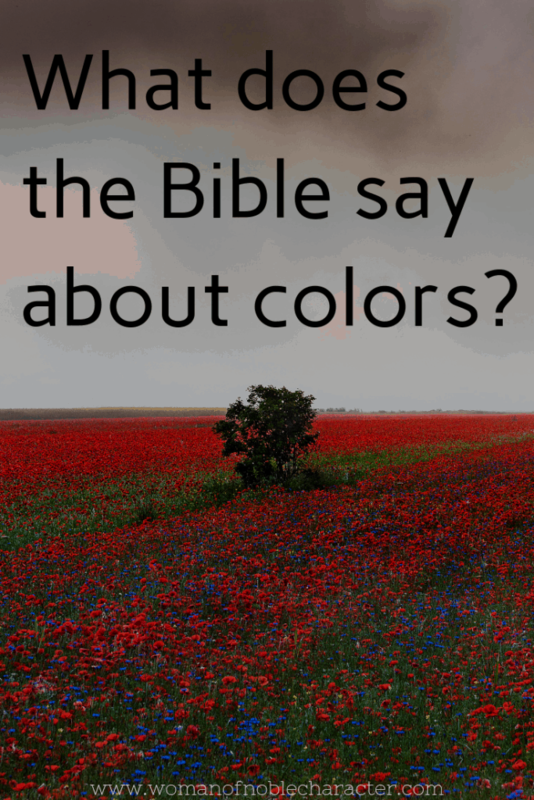 Have you ever wondered what the Bible says about colors? Colors are used throughout the Old and New Testaments to reflect meanings or spiritual truths. 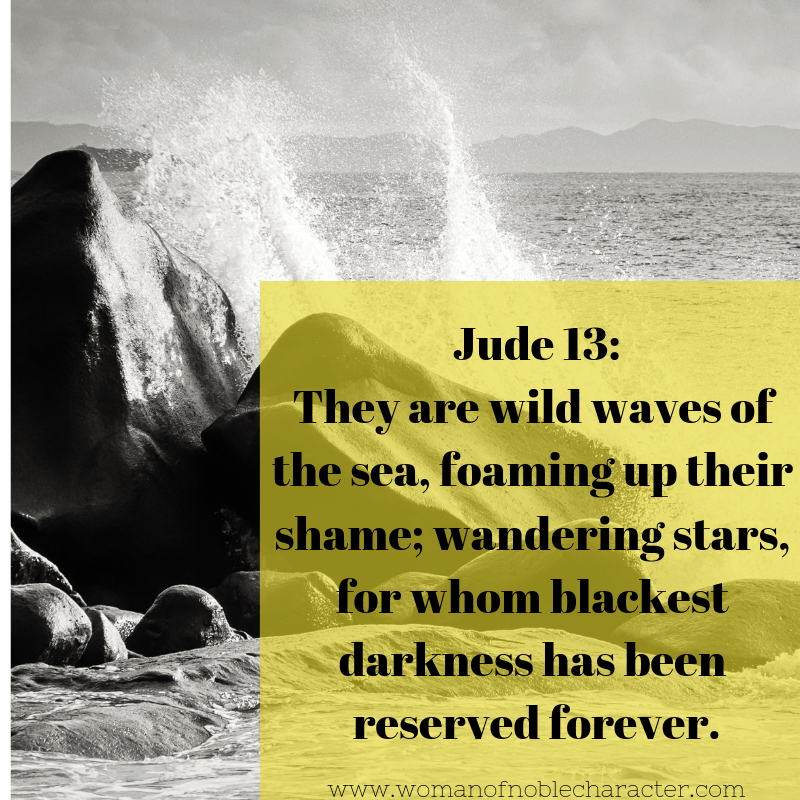 They have a symbolic significance and can remind us of God and his plan for our salvation. Just like with numbers, colors point us to Jesus by symbolizing His Person and His works. Bible symbolism is a part of Hebrew hermeneutics. “Biblical hermeneutics is the study of the principles of interpretation concerning the books of the Bible. It is part of the broader field of hermeneutics which involves the study of principles of interpretation for all forms of communication, nonverbal and verbal.This approach also includes “remez.” A remez is a hint of a hidden message or a deeper meaning that is below the surface or behind the words. Numbers and colors are both remezes. (A remez is a hint—wherein a word, phrase or other element in the text hints at a truth or a deep allegoric – hidden or symbolic meaning).By studying colors we are studying a form of non-verbal communication by God. He uses colors as a visual sign to represent His promises, plan for our salvation and much more. 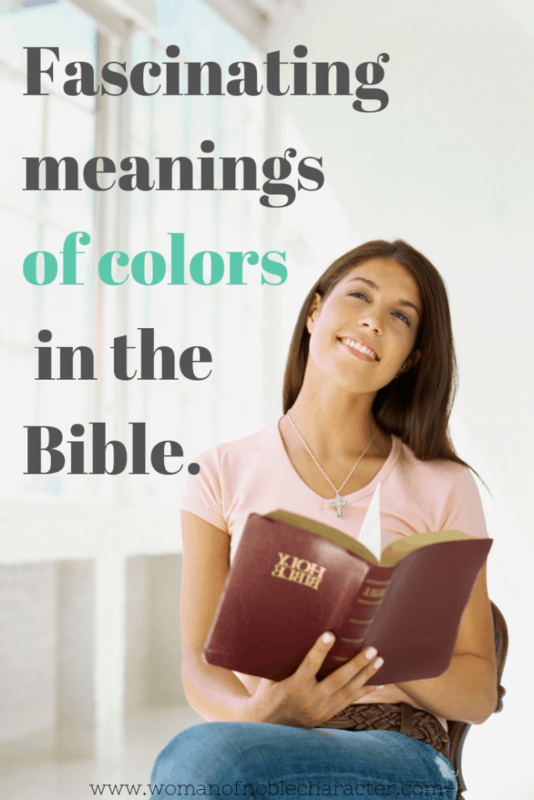 Let’s briefly take a look at some of the colors in the Bible and their meanings. 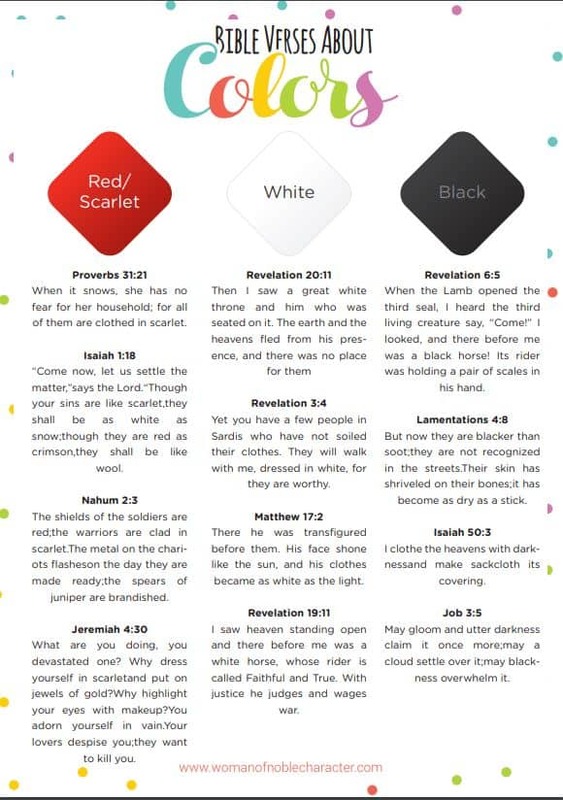 I’ve written several posts about the symbolic meaning of colors in the Bible and have linked each one below for your convenience and deeper study. Red has a number of symbolic meanings. Looking at the Old Testament, oudem is translated “red clay.” Oudem is the root word for mankind. We can infer from this that red represents humanity. 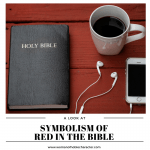 Of course, red is also the color of blood and in the New Testament, Jesus’s sacrifice is described with the imagery of blood (John 6:55) As Jesus’ blood was shed for us, red represents the love of God represented in and through the sacrifice of Jesus Christ. In many Christian religions, red is an official church color which represents the church itself. Red clothing and banners are used during special festivals celebrating saints, Holy Week, and Pentecost. Scarlet, a variation of red,sometimes indicates sin, but some texts also use it to denote royalty. Yellow, is, in my opinion, one of the most significant colors as it is believed to symbolize faith and Glory of God, anointing, and Joy. 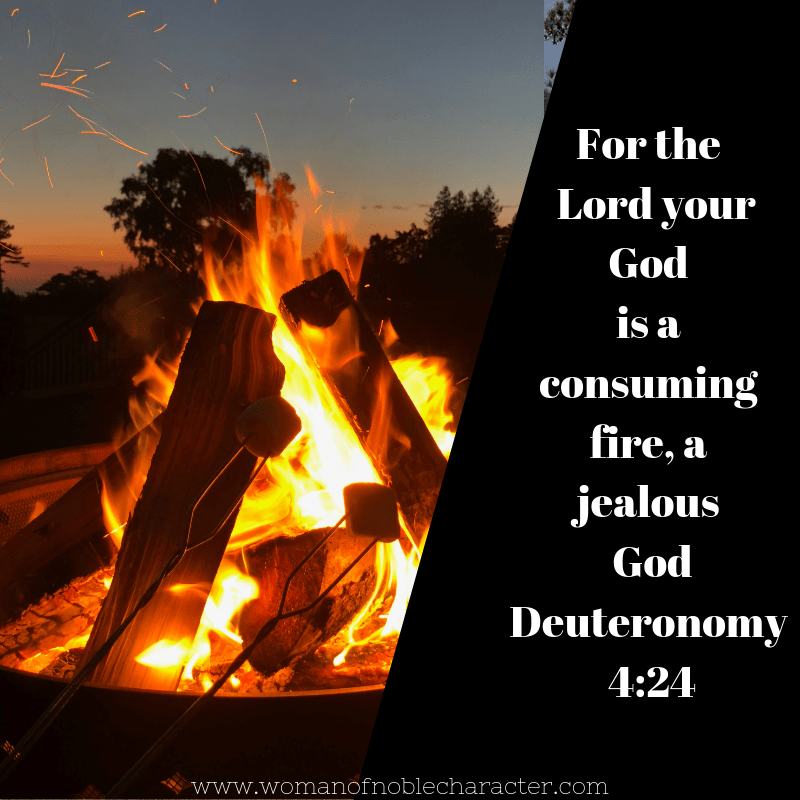 Gold and yellow are often associated or used interchangeably in the Bible. There are two Hebrew words for yellow in the Bible. The first is charuts (usually referring to gold as in Psalm 68:13 or in ); and tsahob, (which refers to the color of hair or the skin of someone who is ill, often of leprosy as mentioned in Leviticus 13:30). Gold was a precious metal valued for its beauty and it’s ease in which to work. The temple was adorned in gold, so it makes sense that the New Jerusalem is described as being made of gold (Revelation 21:18). Therefore, yellow represents the joy, the presence of God, and God’s anointing, whereas gold represents God’s holiness, divine nature, and his majesty. In many churches gold and yellow cloths, clothing and banners are often used to celebrate the holiest days of the year, which of course are Easter and Christmas. The Hebrew word for blue is tekelet which, in some translations is purple (Ezekiel 23:6) or “violet” (Jeremiah 10:9). As I described in my previous post about the symbolism of blue in the Bible, blue dyes were inferior to royal purple. Blue was often used on the clothing of the priests and aligned the hem of the priests’ garments. It was also used in building and adorning of the tabernacle and in the temple. Blue indicates heaven, the Holy Spirit, and truth. Lighter shades of blue are sometimes used to represent the Virgin Mary. In church decoration and celebrations, blue cloth and clothing are sometimes used to represent the season of Advent (although the “official” color is purple). Sapphire, a deep shade of blue, symbolizes the law, commandments, grace, revelation, and the Holy Spirit. Turquoise is sometimes used to indicate the river of God (Psalm 65:9) sanctification, the New Jerusalem, and God’s healing. 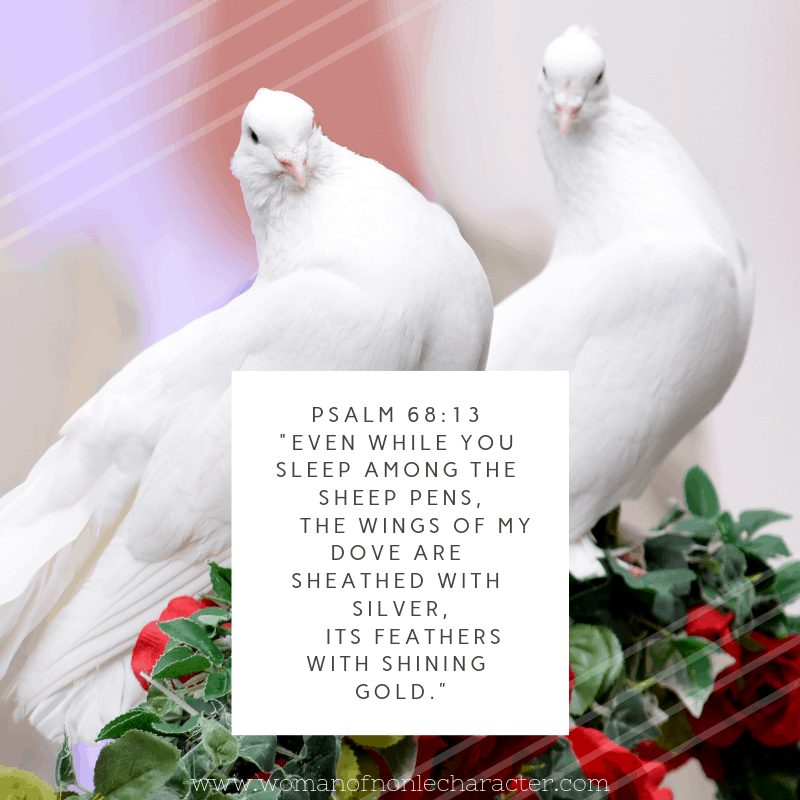 White also represents the absolute purity of God as referenced in Daniel 7:9, the purity of Christ as in Revelation 2:17 and the purity of God’s judgment found in Revelation 20:11. It also is used to depict God’s complete victory over the powers of evil as ascribed in Zechariah 6:3 and Revelation 6:2 and 19:11. White is a common color used in the church, usually for the holiest of days including the Easter and Christmas seasons and other special occasions. Green grass, green trees. God the master painter has blessed us with many variations of this beautiful color. We see the color green in the Bible, throughout. The color green is usually associated with vegetation and represents life. Cedars, a green tree, were popular as a building material during biblical times. Green is associated with the trees that do not lose their foliage and, therefore, green represents life, eternal life, restoration, and a new beginning. It is interesting to note, that while green symbolizes new life, as an official color of the church, it is used during times where there is no official time of celebration. The church calls this period “ordinary time”. (For an in-depth look at the symbolism of green in the Bible, see this post). I find the study of the biblical meaning of colors incredibly fascinating. Perhaps, it is partially due to the fact that I’m also a creative, but I love that God is the ultimate artist and blesses us with rich, beautiful colors in His creation. 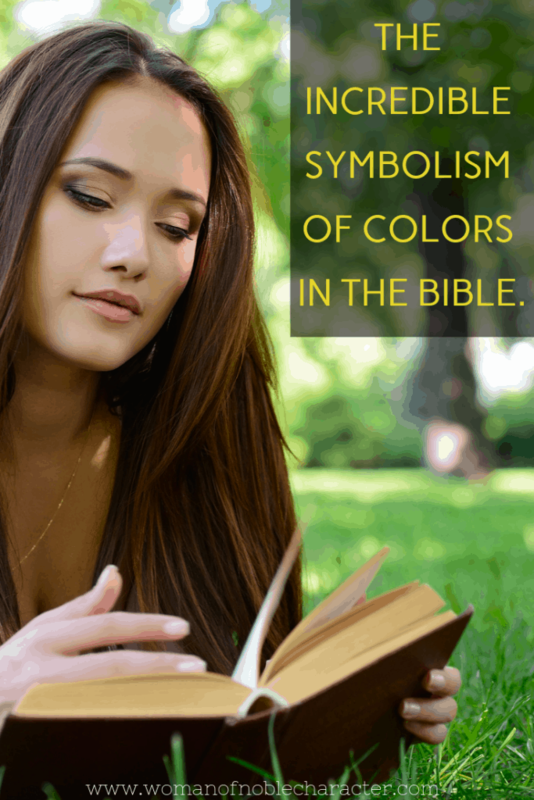 Do you enjoy studying Bible symbolism and colors in the Bible? I’d love to hear your thoughts and interest about this. 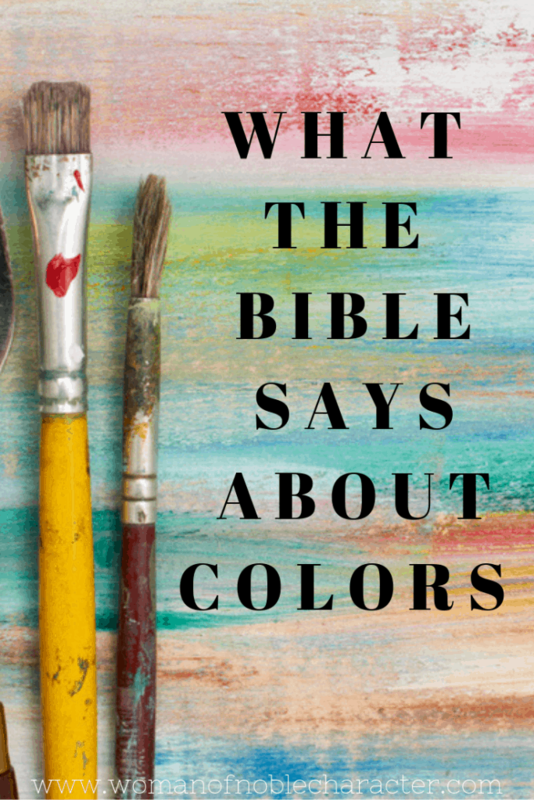 While I haven’t found many resources on color symbolism in the Bible, the below recommendation is a terrific resource (and inexpensive, too!) 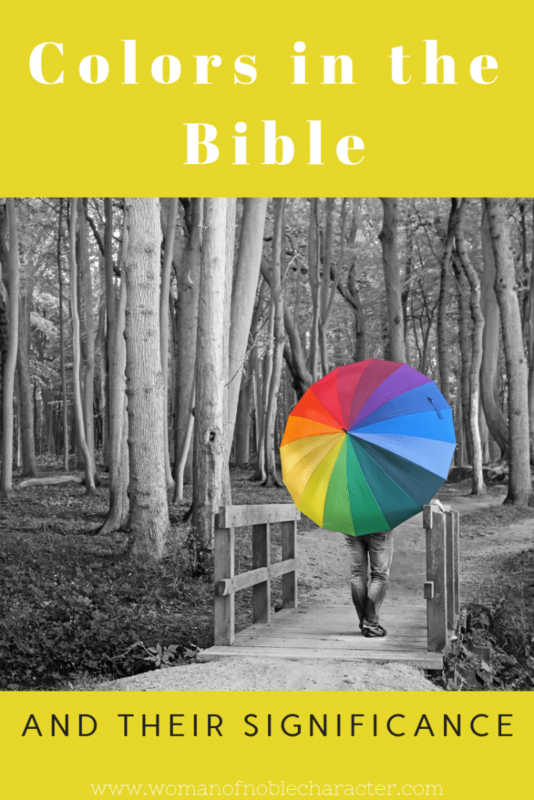 for Bible symbolism, including a section on color. Where can I find the printable PDF about color? I am very interested in this. I’m so sorry! I forgot to include it. I’ve added it now.It’s near the bottom. Thank you for pointing that out and for stopping by! Hi, Lynn – it’s in the post – there’s a PDF toward the bottom – just click on it and you can download and print it 🙂 Enjoy! Thanks for stopping by! Sue, I understand that the color theories have Biblical references, but most of your comments are just common sense, really. Green representing vegetation and life, yellow representing joy, black (darkness) representing sin — just common sense. I was expecting more depth from your article. Hi, Beth – thank you for your feedback. Did you happen to look at the in-depth posts on each color (linked from this post)? They go into much more detail with scripture references. All of my research comes from biblical references and scholars. While much is common sense, the related scripture helps us to think a bit deeper on the meanings and what the colors represent. Thank you for stopping by.